The name bhagavata can be applied to every account of the experiences of those who have contacted God and the Godly (bhagavân and bhakta). God assumes many forms and enacts many activities. The name bhagavata is given to the descriptions of the experiences of those who have realised Him in those forms and of those who have been blessed by His grace and chosen as His instruments. The great work known by that name is honored by all masters of the Vedas. It is a panacea which cures physical, mental and spiritual illnesses. The Bhâgavatam is saturated with the sweetness of nectar, it shines with the splendor of God. The principle of avatâra or the descent of God on earth, the incarnation of the formless with form, for the uplift of beings - is the basic fact that makes the Bhâgavatam authentic. By bhagavata we also mean those with attachment to God, those who seek the companionship of God. For such, the book, Bhâgavatam, is most precious; it is the breath of their life. To be in the midst of such bhagavatas is to foster one's own devotion. Unless you have a taste for godward thoughts, you will not derive joy therefrom. To create that taste, the Bhâgavatam tells stories relating to incarnations to the earnest inquirer. Then, one developes the yearning to experience the thrill of God through all the levels of consciousness. He who has this intense yearning, can be a true bhagavata. People believe that incarnations of God happen only for two reasons: the punishment of the wicked and the protection of the righteous. But these represent only one aspect of the task. The granting of peace and joy, of a sense of fulfilment to seekers who have striven long - this too is the task. The avatâr, or form incarnate, is only the concretisation of the yearning of the seekers. It is the solidified sweetness of the devotion of godly aspirants. The formless assumes the form for the sake of these aspirants and seekers. They are the prime cause. The cow secretes milk for the sustenance of the calf. That is the chief beneficiary. But, as we see, others too benefit from that milk. So too, though the bhaktas are the prime cause and their joy and sustenance the prime purpose, other incidental benefits also accrue, such as the fostering of religious dutifulness (dharma), the suppression of evil and the overwhelming of the wicked. There is no compulsive rule that incarnations should occur only on earth and in human form. Any place, any form, can be chosen by the fully-free. Whichever place, whatever form, promotes the purpose of fulfilling the yearning of the devotee, that place and that form are chosen by the will of God. God is above and beyond the limits of time and space. He is beyond all characteristics and qualities; no list of such can describe Him fully. For Him, all beings are equal. The difference between man, beast, bird, worm, insect and even a god is but a difference of the 'vessel' (the upâdhi). It is like the electric current that flows through various contrivances and expresses itself in many different activities. There is no distinction in the current, it is the same. To speak of it as different is to reveal one's ignorance (a-jñâna). So too, the one single God activates every vessel or upâdhi and gives rise to manifold consequences. The wise see only the one uniform current; the ignorant feel that they are all distinct. God appreciates the consciousness of unity as the basic motive of acts. He does not appreciate the activity itself being one, without variety; it is suited to the various needs. The fruits of karma or activity appeal only to those who identify themselves with the body and not for the others, who know that they are the indestructible âtmâ. Again, you must know that there is no end to the incarnations that God indulges in. He has come down on countless occasions. Sometimes He comes with a part of His glory, sometimes with a fuller equipment of splendor, sometimes for a particular task, sometimes to transform an entire era of time, an entire continent of space. It is the story of the last of these, that the Bhâgavatam elaborates. The drama enacted by the avatâra and the bhaktas drawn towards Him, is the subject matter of the Bhâgavatam. Listening to it promotes the realisation of God. Many sages have testified to its efficacy and extolled the Bhâgavatam, which they helped preserve for posterity. Generally speaking, man gets drawn to sense objects, for he is the victim of instincts. Instincts easily seek sense-objects. They come along with the body and are not derived by any training. The infant seeks milk from the mother's breast; the new-born calf nestles at the udder. No training is needed for this. But, for the infant to walk and talk, some training is necessary. The reason is that they are not automatic; they are socially prompted, by example and by imitation of others. Training is essential even for the proper pursuit of sense pleasure, for it is the wild untrained search for such pleasure that promotes anger, hatred, envy, malice, conceit. To train them along salutary lines and to hold them under control, certain good disciplines like mantra meditation (japa), practice of meditation (dhyâna), fasting (upavâsa), worship at dawn and dusk (sandhya-vandana) etc. are essential. But, however much their value may be praised and their practice recommended, people do not develop a taste for them. This is because the desire for sensory pleasure has struck deep roots in the human heart. When one is asked to do spiritually salutary acts, one has no inner prompting at all. Still one should not give up in despair. Until the taste sprouts, the disciplines have to be strictly followed. This taste is the result of training, no one has it from the very beginning. Constant practice will create the zest. The infant does not know the taste of milk. By taking it daily, it develops an attachment for it which is so deep that when milk is to be given up and rice substituted, it starts to protest. But the mother does not despair; she persuades the child to take small quantities of cooked rice daily and by this process it starts liking rice and it gives up milk. Milk was once its natural food, so, natural that if no rice is available for a single day, it becomes miserable. So too, though sense-pleasures are 'natural' at first by means of practice and training and listening to the commendation of the wise, slowly the greater and more lasting pleasure derivable from the glories of the Lord and their recapitulation is grasped. Thereafter, one cannot exist without that atmosphere even for a minute; one feels that there is nothing as sweet as the experience of listening to the splendor of the Lord. The company of the worldly who chatter about the senses and the sense-objects will no longer attract; the company which exults in praising the Lord will draw and hold. This is the real hall-mark of the good. Sâdhakas and votaries of the Lord are to be judged by these, not by external apparel or appearances. If one mixes with men who revel in sensory talks and activities, then, he puts himself out of court. Spend your time in the company of the godly, engaged in godly affairs. Avoid getting mixed with the company of the ungodly. Do not see their activities or listen to their accounts. Only those who avoid them can be called bhagavatas, God's own. Reading and enjoying the stories of the glory of Krishna in some sacred spot or some temple or prayer-hall-shrine or hermitage of a saint or sage, or in the company of the virtuous and the good - that is a source of great inspiration and joy. It makes people forget everything else. Else, one can approach pious men and serving them, listen to their exposition of the glories of God. Taste for such wholesome literature is the result of accumulated merit and endeavor. It is that merit that rewards one with such company. Listening will be enough in the beginning; later, the stories will arouse interest in the nature and characteristics of God and the aspirant will seek and find for himself the path to realisation. Listening to expositions by the wise is much better than reading oneself; or, one can be looking into the text while listening. It is preferable to listen in company, rather than alone; of course, it is excellent to listen with a number of earnest aspirants. If the person who expounds has had the thrill of genuine experience, then it is the supremest luck, for it yields best results. For, his face will blossom into joy, his eyes will shed tears of joy at the very contemplation of the glory of the Lord. Those who listen to him will catch that inspiration; they will experience the joy themselves. In the midst of a group that weeps, tears will spring out of the eyes of those who have come in. When an infant smiles, those around will also smile in unison. So too, the words of those who are saturated with devotion to God will saturate the hearts of those who listen. It is impossible to measure the profit that one can derive while in the company of the great. Through that process of listening, a dirt-laden heart will be transformed into a clean illumined heart, shining with genuine light. To the foul odors of sense-pursuits, keenness to listen to the glories of God is a valuable disinfectant, besides being in itself so full of sweet fragrance. The listening will cleanse the heart through the prompting it gives for good work. Such a cleansed heart is the most appropriate altar or tabernacle. In that fragrant bower, the Lord will establish Himself; at that very moment, another incident too will happen. The group of six vices - kâma: lust, krodha: anger, lobha: possessiveness, mada: pride, mâtsarya: envy and moha: delusion, (altogether called the anarthas) that had infested the place will quit without so much as a farewell. When these vices quit, the wicked retinue of evil tendencies and vulgar attitudes which live on them, will break camp and disappear without leaving even their addresses! Then, man will shine in his native splendor of truth and love (satya and prema); he will endeavor without hindrance to realise himself; and finally, he will succeed in merging with the universal and eternal. He will liberate himself from the tangle of ignorance, or mâyâ. His mind will fade away; the long-hidden secret will be revealed to him; he will discover his mâdhava-tattva (godliness, god-principle or divinity). Man's nature is love (prema). He cannot survive a moment, when deprived of love. It is the very breath of his life. When the six vices (anarthas), to which he was attached so long, disappear, love is the only occupant of the heart; but love has to find an object, a loved one. It cannot be alone. So, it is directed to the dark-blue divine child, the charming cowherd boy, who is purity personified, who is the embodiment of service, sacrifice and self-lessness, who has taken residence in that cleansed altar. There is no scope now for any other attachment to grow. So, step by step, this Love for Mâdhava (name for Krishna as the blooming hero, the sweet Lord) becomes deeper, purer, more self-denying, until at last, there is no other need for thought and the individual is merged in the universal. 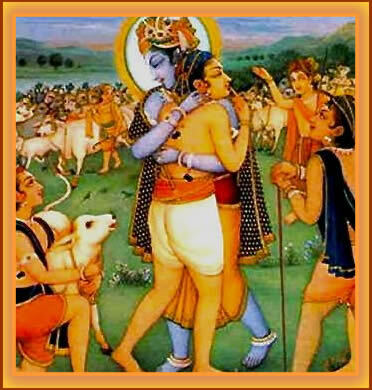 When Vâsudeva enters the heart of man, vasudeva has no longer a place therein. In other words, when the deva of vasu or wealth is seated in the heart, the divine Vâsudeva or Krishna cannot dwell therein. Any attempt to accommodate both in the heart is bound to fail. Darkness and light cannot exist at the same time and in the same place; they cannot continue together. Riches (dhanam) and God (daivam) cannot be joint ideals; when dhanam or riches is sought, daivam or God cannot also be achieved. If both are sought by man, what he will achieve will be neither dhanam nor daivam but dayyam (the devil). It is creditable if man behaves as man; it is laudable if he behaves as the Mâdhava, he really is. But, to behave as a demon or as a beast is despicable indeed. For, man was long born a mineral and died a mineral; then, he promoted himself as a tree. He was long born a tree and died as a tree; but, in the process, he got promoted as an animal; but, he has now risen into the status of man. This rise from one scale to another has been acknowledged by science and spiritual experience. Now, alas, he is born as man and dies as man. It is a greater shame if he slides into the beast or a beastly ogre. Praise is his due, only if he rises to the divine status. That is real fulfilment of his destiny. Therefore, avoid contact with vices; develop attachment to virtues; transmute the heart into an altar for the Lord; destroy all the shoots and sprouts of desire; then, your Manasa-sarovaram (the lake of your inner consciousness) will be sublimated into a Ksheera-sagara, (the pure ocean of milk, where the Lord reclines on the serpent-couch). Your real self will, like the celestial Hamsa, revel in the placid waters of that lake, thus transformed. It will discover endless delight. Who can mark the beginning of the continuous waves of the ocean? It is an impossible task. If anyone decided to do so, the wave with which he starts the calculation will be considered as the beginning, the wave with which he stops his calculation will be for him the last, the end. There is a beginning and an end for his count: there is no beginning or end for the process. No one can visualise either, in that boundless illimitable expanse. God's glory is the shoreless ocean. When one starts describing it, it begins for him; when he finishes his description it is the end, so far as he is concerned. But, His glory is beyond space and time. Only little minds, limited minds, will argue that God's glory has a beginning and an end. The stage on which He plays (His lîlâ) has no boundaries. 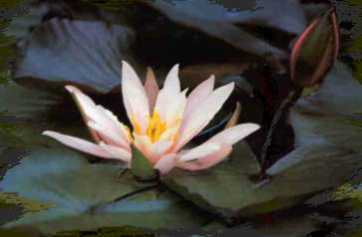 The story of the Lord's adventures (lîlâs) is all nectar; it has no other component, no other taste, no other content. Every one can drink his fill, from any part of that ocean of nectar. The same sweetness exists everywhere, in every particle. There is nothing inferior to mar the sweetness. The love of God and the love for God are both eternally sweet and pure, whatever the method of your accepting or attaining them. Such love is holy and inspiring. Sugar is sweet when eaten during day or during the night. For it is night or day for the person who eats, not for the sugar. Sugar behaves uniformly always. Nathdwara, in Rajasthan, India. Source.